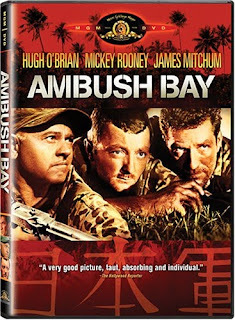 “Ambush Bay” is the poster-child of how to make a World War II film based solely on clichés. 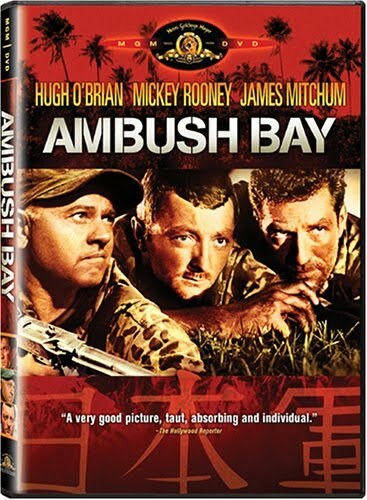 This said, the result is a very entertaining but always paper-thin look at espionage in the Pacific Theater. 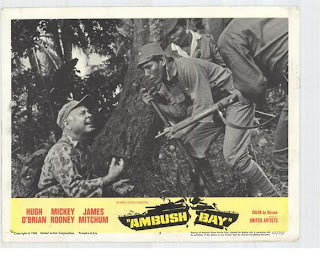 Four days before General MacArthur’s invasion fleet is slated to return to the Philippines, a squad of Marines is dropped on Mindanao with a risky assignment: penetrate enemy-held territory and contact a spy named Miyazaki who operates out of a heavily-guarded Japanese rest camp. They spy has information vital to MacArthur’s intelligence department. The Marines are all experts in the field of killing, except for Pfc. 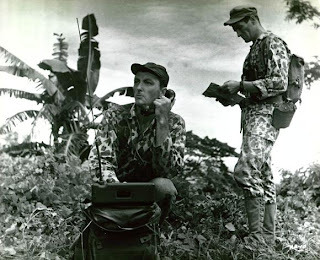 Grenier (Jim Mitchum, “Leathernecks”), a PBY radio man who was assigned to the team at the last minute when the original radio operator got sick. Grenier doesn’t hit it off with the veterans, especially the macho Sgt. Corey (Hugh O’Brian, “In Harm’s Way”) who winds up in charge of the mission when the Captain (Clem Stadler) becomes a casualty. The piece is cliché-ridden from start to finish – in what movie have we not seen the characters, setting or mission before? Ron Winston handles every bit of this nonsense seriously – so seriously, in fact, that despite the flaws, it’s very easy to enjoy this movie, even in a tongue-in-cheek sort of way. O’Brian gives a passionate performance, even if his character is anything but original and personal. His Sergeant is virtually a superhero, as Sgt. Wartell (Mickey Rooney!) reveals to Grenier by describing a series of Corey’s early battle exploits on Guadalcanal and Tarawa. 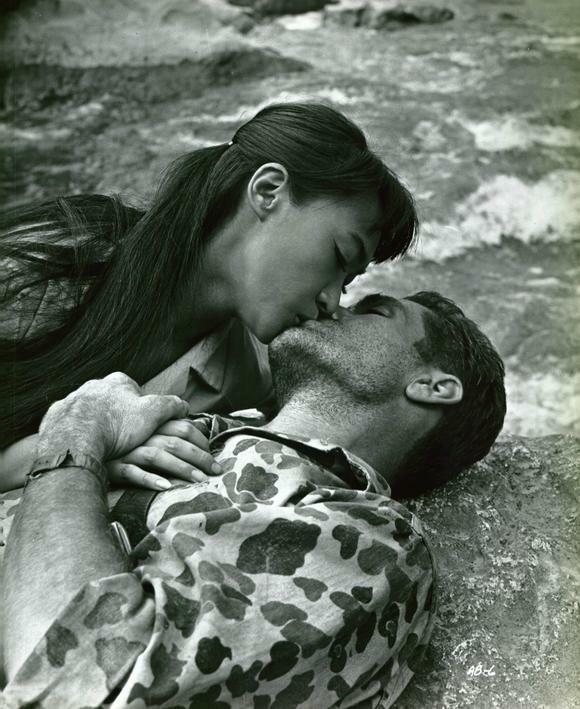 Rooney looks to be thoroughly enjoying himself as he scales cliffs and mows down Japanese infantry by the dozen, although he looks way too old and simultaneously boyish to be a believable career marine. Although he gets third billing, Mitchum’s is the most developed and believable character. He’s a person any viewer can relate to: thrown into a situation beyond his control, Grenier is forced to adapt to ever-changing conditions – and fast – because his life may depend on it. He wants to do his job well, but doesn’t have any natural talent, and therefore his peers look down on him with utter contempt. His performance never strikes a false note, and he even gets to lapse into some voice-overs to keep things fresh. The on-location photography is stunning from beginning to end. Had this film not been shot in the Philippines, any credibility would have been totally lost. The exteriors are appropriately lush and beautiful. Winston and cinematographer Emmanuel L. Rojas don’t just take us into the steamy jungles; we get to venture into rice patties, across streams and down rushing, crystal clear blue rivers. 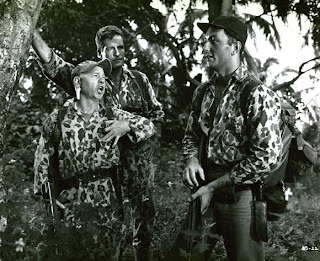 I absolutely hate it when producers try to make ridiculous locations like North American forests (“The Green Berets”) or rocky plains of Spain (“The Thin Red Line”) pass for Asian or South Pacific jungles. The technique just doesn’t work. 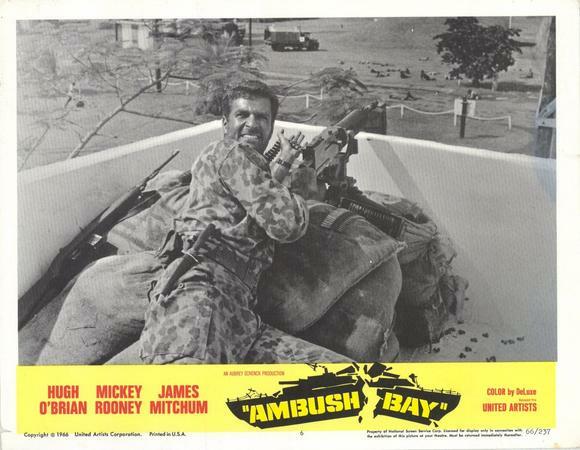 Kudos to Winston for choosing to shoot this film in the actual locations it is said to have occurred at. Although the movie runs nearly 2 hours, the time flies by. The pace is kept fluid in two ways. The characters are constantly on the go. The only reason they stop is rest, and we’re treated to discussion revealing something of their character. For example, we don’t get to know Corey as a person until late in the film when he develops a relationship with Tisa Chang’s character. When the men aren’t hiking or resting, they’re engaged in some sort of combat with the enemy – patrols, tanks and indigenous cannibals constantly hamper their progress. Winston doesn’t dwell on the supporting cast at all: most of them are non-essential characters that he kills off in a few early encounters with the enemy. We constantly ask ourselves “Who is going to get killed next?” This curiosity keeps us engaged right up until the climactic battle inside a fortified Japanese radio installation. All of that said, it’s necessary to point out several technical flaws which make the proceedings difficult to take seriously. The members of the squad are introduced as crack masters in the art of warfare, but by the half-way point, almost all of them have been killed by your average Japanese draftee - and usually for stupid reasons. The special effects are very below par, even for a low-budget film from 1966. One encounter with a Japanese tank is packed with some most ridiculous elements – including two of the least believable explosions ever caught on film. 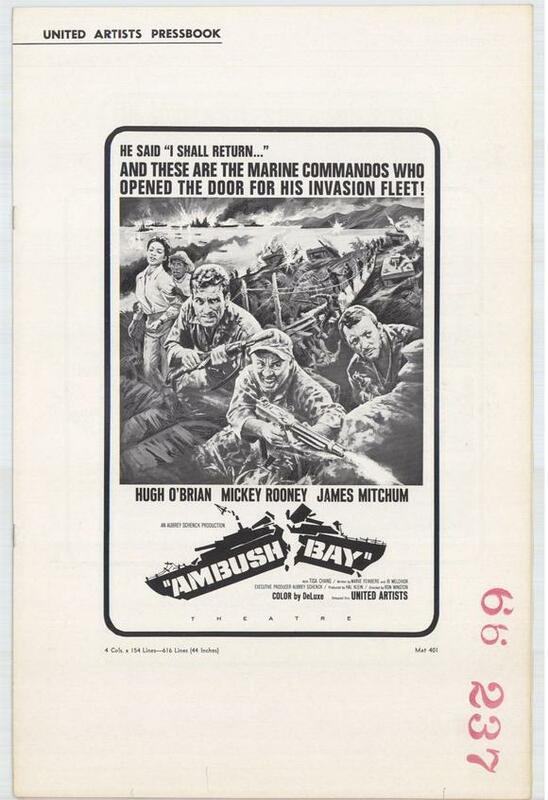 (It’s also impossible to overlook the fact that later on in the film, Corey, Grenier and Miyazaki take a breather at the exact same outdoor location that the Marines were engaged in a firefight near the beginning of the movie). 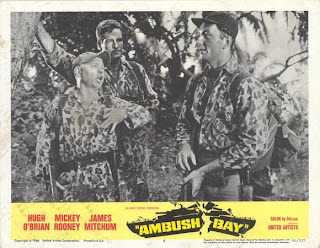 The rubbery, funky camouflage uniforms and ridiculous baseball-style caps look like something a Green Beret or Navy SEAL might have worn in the 1960s, but are totally out of place in a World War II movie. Wartell’s encounter with a Japanese patrol involving “Baked potatoes” has got to be one of the corniest “stupid typical bad guy” scenes ever. And, finally, when the movie reaches its climax – first of all, how lucky can our heroes get? The way they manage to break into the Japanese fortress is unbelievable, and the amount of bullets Corey takes while blasting at hordes of enemy troops with a machine gun is ludicrous. Perhaps it’s the unbelievable, overstated corny parts of “Ambush Bay” that make it such an entertaining film; or maybe it’s more serious, sincere performances of Mitchum and O’Brian that make it stand out from the deluge of “jungle patrol” stories out there. 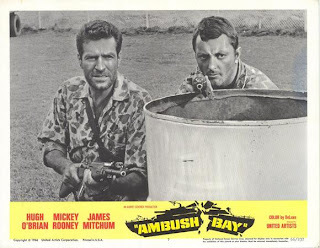 Whatever the reason, it’s thoroughly enjoyable has been a perennial favorite of mine since the days of the now-forgotten TNT Memorial Day Marathons. Now that it’s available on DVD, a whole new audience may have opened up. 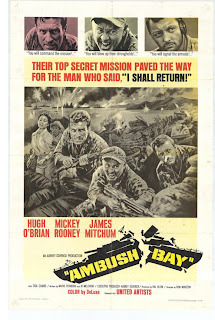 Executive producer Aubrey Schenck seems to have dusted off the plot of his shorter (and superior) 1954 WWII war flick, "Beachhead," with some tweaking by writers Marve Feinberg, and Ib Melchior (best known for the sci-fi classics "Angry Red Planet," "Robin Crusoe on Mars," and "Planet of the Vampires"). Add veteran TV director Ron Winston and gorgeous Phillippine locations to the stew, and you have a watchable B-movie that manages to entertain in spite of an unnecessarily protracted final act. 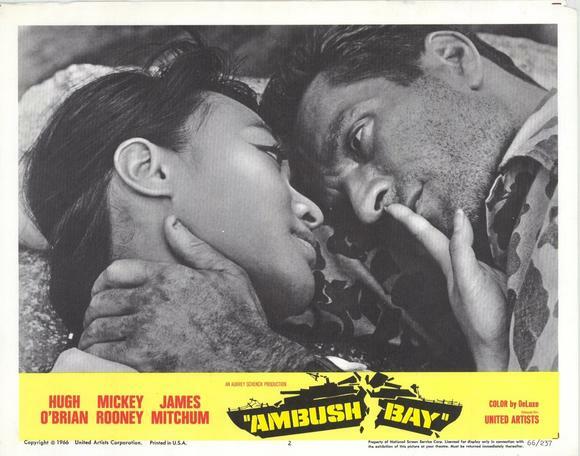 Winston's forays into feature films were limited to a tight quartet - of which " Ambush Bay " was his debut - but the prolific TV director had already handled diverse material in shows like "East Side, West Side " and zippy action vignettes in the cult classic series "The Man from U.N.C.L.E." "Ambush" moves well, and in spite of some seriously inconsistent day-for-night photography, the scenes are well integrated with the jungle locales. 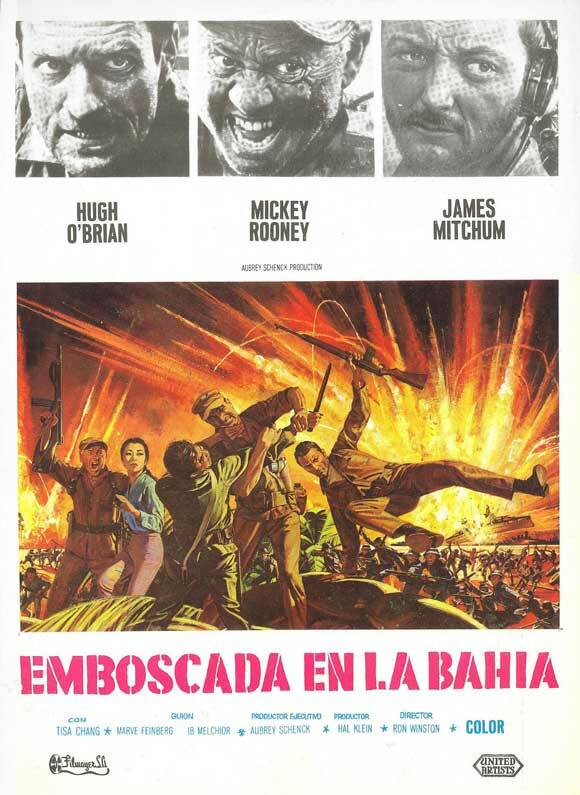 MGM's transfer is taken from a very crisp print, and the original mono mix is fairly standard, showcasing the orchestral score by legendary hack composer Richard LaSalles (shamefully imitating music from "Bridge on the River Kwai," and "Mutiny on the Bounty"). Producer Schenck boosted the film's marquee value by adding Hugh O'Brien from the popular Fifties series "The Life and Legend of Wyatt Earp," former child-star Mickey Rooney, and James (son of Robert) Mitchum. Neither three have much to work with, but play their familiar archetypes well. Director Winston got better material the following year with "Banning," and directed episodes of "McMillan and Wife" before his death in 1973. 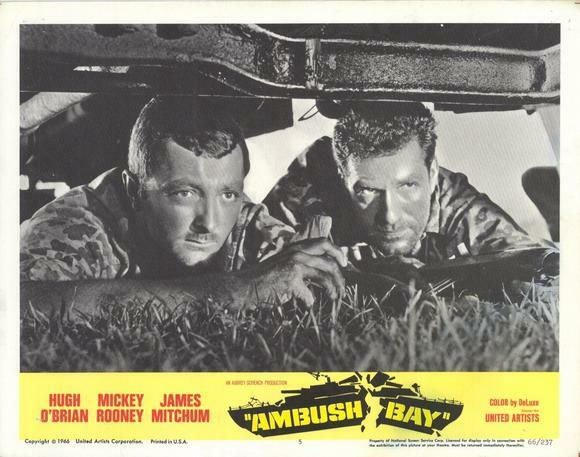 Veteran TV director Ron Winston ("The Gamblers"), in his feature film debut, helms this action-packed but thin WWII drama. 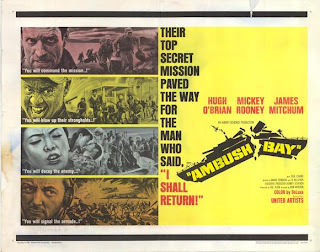 It's written by Marve Feinberg and Ib Melchior in a no-nonsense taut way, following along the lines of the 1954 Beachhead (but not as good!). 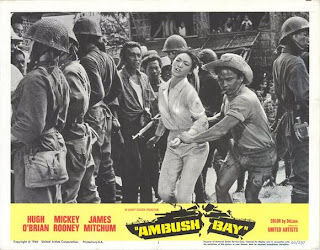 It tells of a special reconnaissance unit of nine U.S. marines in October of 1944 who are on a secret mission in the Philippines (filmed on location in the Philippines) in which they have 96 hours to locate a Japanese-American girl, Miyazaki (Tisa Chang), who has information for General MacArthur's planned invasion of the Japanese-occupied island. When their leader Capt. Alonzo Davis (Clem Stadler, Lt. 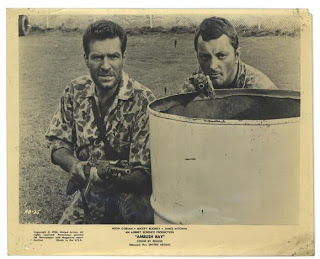 Colonel military adviser for pic) is killed, the hard-nosed Sergeant Corey (Hugh O’Brian, a former drill instructor in the marines) takes command. 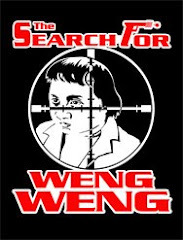 The patrol must fight their way through the jungle and only a handful survive when they reach their destination and rescue Miyazaki from enemy captivity. She tells them the enemy has learned of MacArthur's planned invasion route and have mined the bay he will use. The patrol's radio has been destroyed, so they can't communicate this valuable intelligence. 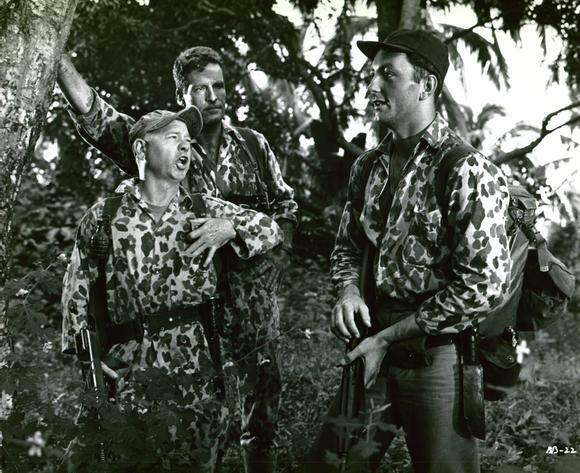 Sergeant Wartel (Mickey Rooney) plays the hero and stays behind to keep the enemy occupied, at the cost of his own life, as Corey and Pfc. 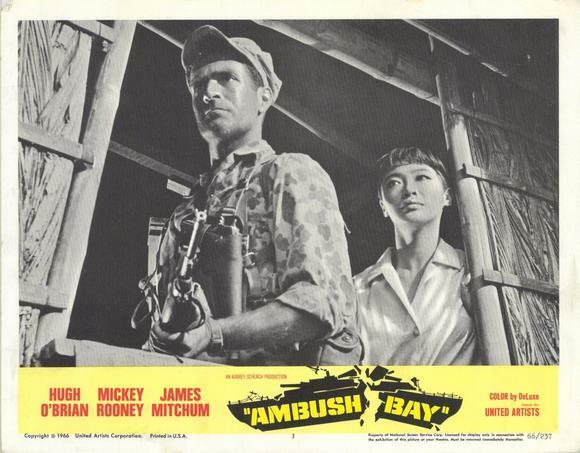 Grenier (Jim Mitchum, Bob's son), set out with Miyazaki to detonate the mines. Miyazaki will sacrifice her life to save her rescuers and though Grenier, the only inexperienced member of the marine patrol, is the sole survivor, the mission is deemed a success. 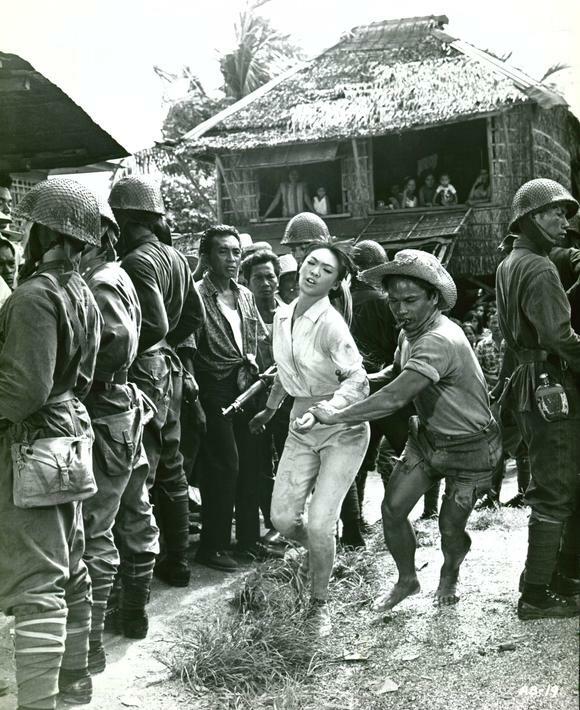 It ends with the MacArthur radio broadcast: "People of the Philippines, I have returned." 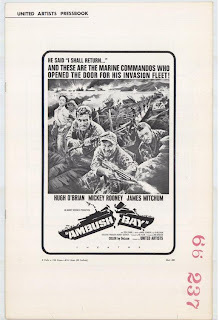 It's entertaining, especially for those action freaks and those not minding propaganda films about how war is a chance to prove one's manhood.